The core of the MailStore Server consists of a fully integrated storage technology that can manage large amounts of data both efficiently and safely. It doesn’t require an external database management system and is available immediately after setup is complete. Users can access the archive using a number of methods (such as integration into Microsoft Outlook and Web Access) and quickly browse the emails using an incredibly powerful full-text search. Access via the familiar folder structure is also possible. MailStore Server is no one-way street. All emails can be restored from the archive in standard formats at any time. 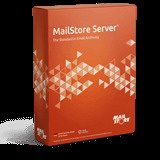 This guarantees your company’s independence over the long-term, even from MailStore Server itself.